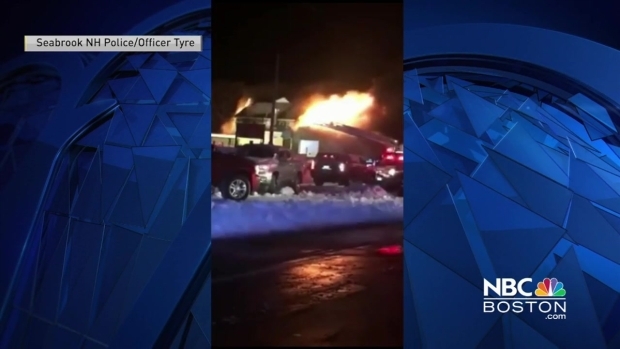 Officials are investigating after a 3-alarm fire completely destroyed a New Hampshire business. Seabrook Fire Department said firefighters were called to the blaze at 207 Ocean Ave., a two-story wood frame building with Catalano's Market downstairs and apartments above, shortly after 3 a.m. Wednesday. Mutual aid came from 14 different fire companies in New Hampshire, Maine and Massachusetts. It's not clear how many people were displaced by the fire. A three-alarm fire broke out in Seabrook, New Hampshire, early Wednesday morning.